Being an artist, or any online seller, you will know that photography is just as important as the work itself. Good photos are a must for anyone who is trying to submit to galleries and showcase online, and it's especially important when trying to convey the painting's message and overall feel. If you are looking to sell fine art giclée prints, online or locally I would definitely recommend taking the extra time to photograph and present your work the properly. 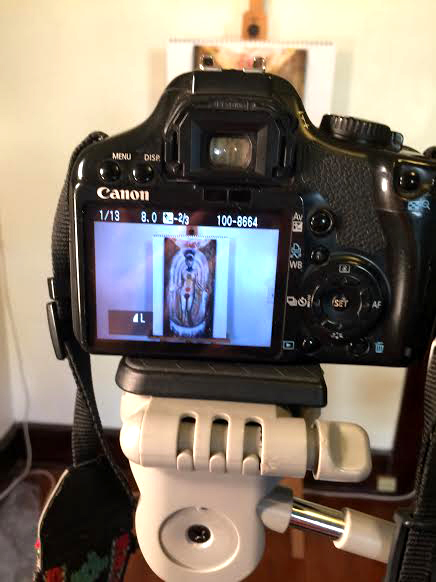 Photographing your art may seem daunting, but there are many methods and tutorials available online to help. After several years of trial and error, research and exploration of my own camera; I've found what works best for me! If you can get a hold of a high-resolution scanner for the smaller stuff, then by all means use that. A scanner will get you the best quality and color matching possible. But, it doesn't work on larger paintings. Photograph with natural light only. You can photograph your artwork outside. Just be sure it is a cloudy or overcast day and out of indirect sunlight. If you are a night owl like me, you can photograph indoors too! If shooting indoors, use natural spectrum light bulbs only. I feel every artist needs to be painting under these! They bring out the true colors and aren't "yellowy." Use a tripod and a self timer. Limit human contact with the camera at all costs. Turn off your digital zoom if you have it, and don't use a wide angle lens. Use a blank white wall for a background if possible. This cuts down on post production time by helping balance the color. Don't photograph a framed piece or anything with glass on it. If you use a gloss varnish, photograph your work before adding the final coat of gloss. Take several photos, adjust a few settings, take a few more. You can compare later. The camera lens needs to be parallel and centered to the painting. This is probably the most important and trickiest part. Achieving professional looking, website and giclée quality photographs of art. I am working with a Canon Rebel xsi. Your camera settings might be different, so you may need to make a few adjustments. Set your lights up around your work. 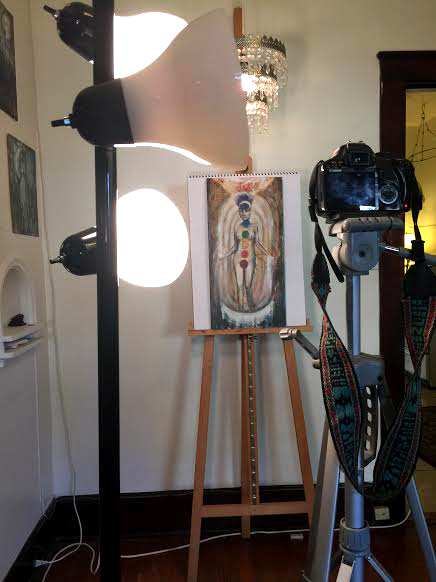 The lighting should be evenly spread over your painting, not directly at it like a spotlight. You can play with the lighting as you go. Change positions, angles, turn some off, experiment with what looks right. Be very sure that the angle of your camera is parallel to the angle of your art. This will save you so much time in post processing, and you won't have any distortion in your painting. Be sure the camera is focused at the center of your art. This also helps with distortion. The edges of your painting don't have to go to the edge of the view finder, but should fill most of it. Focus your camera, and take a photo. I use my camera's autofocus to get the sharpest images. You can experiment with manual focus if you want, but I've noticed that my camera always gets the best shots. Experiment with the exposure settings and shutter speeds. Occasionally zoom into your picture with the digital playback (if you have one) and check the quality. I like to go all the way to 200% to make sure things look sharp. Snap a few photos then change some settings. You can move some of your light's angles, or turn some off entirely. Experiment with lighting and settings.. just don't move the camera or the painting. Notice how my lights don't actually point directly at the painting. They are used to light up the room. (I have more lamps on the other side of the camera as well. Once you have a few good photos taken, upload them into your software editing program. I feel it takes more time to clear the space out, then set things up over the white wall, than it does to actually take the photos.. but the work is worth it! Because if done right, there won't be much else to do on your computer. Once, in your editing software you can play around with color balance, and white balance to make sure it looks like your original. Then crop it, add your watermark and it's ready for use! Here is my photo in photoshop. I haven't done any editing on it yet! The cropping lines match up perfectly with the painting's edges, which shows me that there is no distortion in this painting's duplicate. There are a few lighting adjustments to make, but other than that my image on my computer, in high quality, and large enough to be made into posters, and fine art giclee prints! Great quality photographs open doors to more possibilities of presentation! Your photos can now be used for ads, placed in mock ups, put into social media, or used on your website. Whether you want to make giclée prints of your paintings, share your work online, or keep a record and catalogue of your work, it's important to know hot to take a professional photograph of a painting. Taking the time to photograph you work is an important part of being an artist and online seller. Getting good photographs can make all the difference between selling or not selling your art!